Since I reported on this blog on the tragic murder-suicide in Orangeville/Mono some new information has come to light about this very sad story. The young son Connor, 14 of Heidi & Hugh Ferguson has disputed some of the published accounts of what happened that fateful day defending his father. "My father was a wonderful man and was not the crazy man that shot at cops during the event as you stated," wrote the couple's son in an e-mail. "You would never understand the full story behind the ... situation between my mother and father," he stated. Connor wrote the e-mail to Sun Media objecting to a published account from a neighbour who told a reporter the man shot the tires of an Ontario Provincial Police van. Police have now confirmed that no shots were fired at police and said the van had driven over a spike belt police laid out on a roadway. The full details of what initially sparked the tragic chain of events may never be known but according to OPP Constable Peter Leon the police received an initial call about an hour before the shooting involving a domestic dispute at the Orangeville address. There was no weapon involved in the initial incident, but police wouldn't say if Heidi Ferguson was threatened or assaulted. Orangeville police were "actively investigating the original call and they were called back to the residence," Leon said. The whole incident has shocked many friends, neighbours and the community. "It was such an amicable breakup," said Bridget Wilson, a neighbour who knew the Fergusons for 19 years. "I never heard a bitter or a nasty word from either of them. I get a headache thinking what could have gone so horribly wrong." "Everything was fine," said Wilson, who recalls they hosted a party two weeks ago for the lacrosse team their teenaged son, Connor, plays for. Their daughter, Courtney, is 19. "This is completely out of character," Penny Bogner (Heidi Ferguson's mother) says of the allegations against Hugh Ferguson. "They were really remarkable people. They were friendly even though they separated." Todd, a teen who worked with Courtney at Boston Pizza, said he remembers her saying a few months ago: "My parents are still good friends – thank God for that." 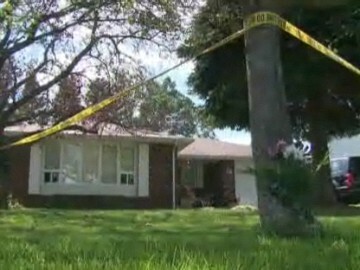 Ontario's Special Investigations Unit continues the investigation. It’s quite possible that the wife did what so many other women are doing these days and threatened to (falsely) accuse him of abuse, ….. in which case he would be arrested, charged, jailed, and certainly convicted ….. UNLESS he could afford the best lawyers. In ontario there is no true justice for a poor male because women have been given special rights, protections, and privileges above and beyond belief. Men are ALWAYS considered to be the abusers and only in the most obvious circumstances are women even suspected of lying. Many take advantage of this and can literally destroy a man with the help of the so-called justice system which in practice is a total farce and a disgrace. If he can’t afford a lawyer and is rejected by legal aid he’s forced to defend himself against the full resources of government funding to women’s help groups, and instructions to the crown attorneys to work “most diligently” for a conviction. In spite of the supposed “preponderance of evidence” needed for a conviction, all that is actually required is for the judge to give a woman “credibility” because “she spoke so clearly and confidently”. At trial, after going through the virtual hell of arrest, confinement, being told he can never go back to his home (which he bought with an inheritence from his father), never being interviewed, never allowed to contradict the woman’s lies or to present evidence, the man is anything but confident as he sees her accompanied by a woman’s advocate/coach/moral support and gently encouraged to embellish her lies with (fake) emotional emphasis. If he successfully destroys the police credibility and the crown attorney detroys his own credibility by repeated attempts to lead the witness (the woman), it becomes a case of “he says/she says” and that’s when the farce is shown to be just that! The judge gives her credibilty and that, after all, is what all the pomp, circumstance, and the entire process is all about. Put on a big show and convict the man regardless of evidence. The woman gets the bank account, the home, and if any children are involved she gets total custody. The man gets an undeserved criminal record, contempt, and a jail term unless the court is “generous” …. in which case he is often given impossible probation tasks and threatened with jail and/or other penalties if unable to perform them. I know, because at 76 years old I’m trying to get through the probation and finding it impossible. I doubt that I’ll survive until Christmas since the past year of constant stress has destroyed my health which wasn’t very good to begin with. By the way, …. did I mention it was my second marriage? Unfortunately she turned out to be a gambling addict and pathological liar, but now she gets everything and my ten kids (none of them hers) get nothing. The irony is that the net result of this female favoritism and anti-male bias has resulted in a growing number of women being murdered. All our so-called justice system has accomplished to date is the destruction of families and needless murder suicides. Congratulations to politicians for a job well done. This woman was my cousin. I can assure you she was assaulted, and badly. The physical evidence of her assault was enough so that the police immediately attempted to locate and arrest him. During the time the police were actively looking for Hugh, he returned to Heidi’s home and killed her. This is tragic on so many levels, especially for the two great kids they left behind. There is absolutely no correlation between our tragedy and your story. Please respect our extraordinary loss and vent elsewhere.